ALEXANDRIA, Va.--(BUSINESS WIRE)--Time spent in transit is the most challenging aspect of business travel, according to a new report released today by the GBTA Foundation – the education and research arm of the Global Business Travel Association. 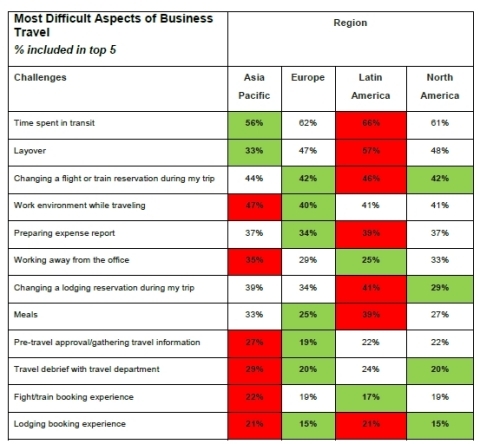 Layovers, changing a flight or train reservation mid-trip, the work environment while traveling and preparing expense reports also topped the list of most challenging aspects for North American business travelers. 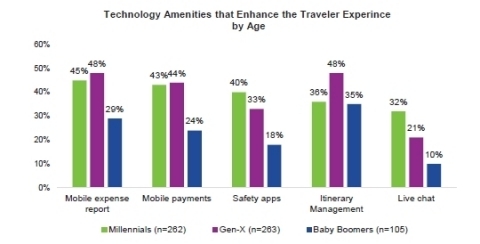 The study, Creating a Frictionless Travel Experience – North America, conducted in partnership with Sabre Corporation (NASDAQ:SABR), identifies the main challenges business travelers face during their travel experience while also looking to understand what organizations are doing to make this experience a better one for their travelers. The top pain points all have one thing in common – they are time consuming. Given that 72 percent of business travelers are middle management or higher, it is not surprising that they are concerned about losing time or having an adequate work environment. “With advances in technology, corporate travelers are plugged in and connected more than ever before. While the technology is out there, this report demonstrates that we still have work do to make corporate travel more seamless, reducing the number of apps and tools needed to organize their trip, while also optimizing compliance and reducing costs,” said Wade Jones, executive vice president and president, Sabre Travel Network. “It is critical we organize and align our resources to execute on integrating technology into a sustainable, data-rich platform that supports the business travel experience across the spectrum of planning and booking to reconciling expenses at the end of the journey." Business travel can have a considerable impact on employee satisfaction and retention as more than three-quarters (79 percent) of business travelers say their business travel experience impacts their overall job satisfaction at least somewhat. This is especially true among Millennials (88 percent). Business travel not only influences how employees feel about their current company, it can also influence whether they take a job in the first place. Nearly three in five (59 percent) indicate a company’s travel policy is an important factor when considering a potential new employer. 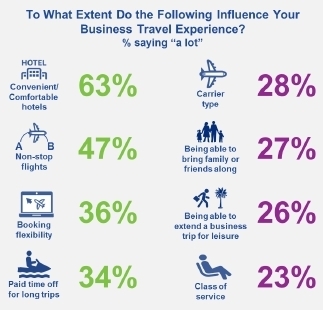 Additionally, the vast majority of travelers (84 percent) say the quality of their business travel experience impacts their business results at least somewhat. When asked what perks or amenities impact their business travel experience the most, convenient and comfortable hotels topped the list for business travelers followed by non-stop flights, booking flexibility and paid time off for long trips. 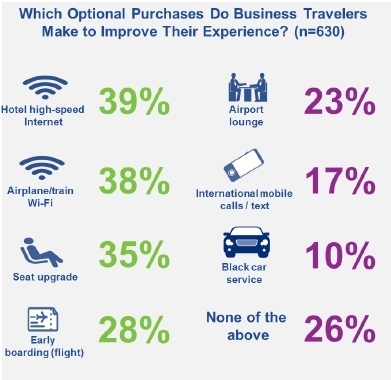 Looking at optional purchases business travelers make on their own to improve their experience is also telling. These include hotel high-speed internet, airplane/train Wi-Fi, seat upgrades and early boarding. Travelers most often mention that these purchases help them improve their productivity on the road. Technology also makes an important contribution to business traveler satisfaction, enabling a more efficient travel process. 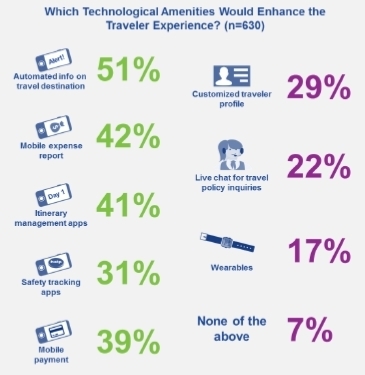 Business travelers indicated a variety of technological amenities would enhance their travel experience with automated destination info, mobile expense reporting, itinerary management apps, safety tracking app and mobile payment topping the list. Millennials and Gen-Xers are far more likely than Baby Boomers to mention mobile payment. Mobile expense reporting and safety apps also top the list for the younger groups as well. The GBTA Foundation, in partnership with Sabre, also surveyed business travelers in Asia Pacific, Europe and Latin America. While there are many similarities among business travelers around the world, there are also several key differences. For a release focused on each region, please click here: Asia Pacific, Europe, Latin America. The report, Creating a Frictionless Travel Experience – North America, is available exclusively to GBTA members by clicking here and non-members may purchase the report through the GBTA Foundation by emailing pyachnes@gbtafoundation.org. Methodology: The GBTA Foundation used a mixed-methods approach for data collection, consisting of an online survey of business travelers and in-depth interviews of travel buyers, travel management companies and human resource personnel in four different regions: Asia Pacific, Europe, Latin America and North America. Survey data was collected between March 28 and April 8, 2017, and 20 in-depth interviews were conducted between May 8 and June 2, 2017. Sabre Corporation is the leading technology provider to the global travel industry. Sabre’s software, data, mobile and distribution solutions are used by hundreds of airlines and thousands of hotel properties to manage critical operations, including passenger and guest reservations, revenue management, flight, network and crew management. Sabre also operates a leading global travel marketplace, which processes more than US$120 billion of estimated travel spend annually by connecting travel buyers and suppliers. Headquartered in Southlake, Texas, USA, Sabre serves customers in more than 160 countries around the world. 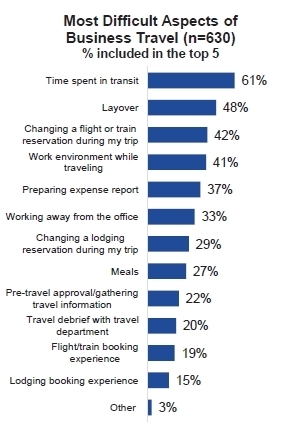 Time spent in transit is the most challenging aspect of business travel, according to a new report released today by the GBTA Foundation.